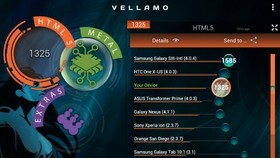 - Vellamo is designed to be an accurate, easy-to-use suite of system-level benchmarks for devices based on Android 2.3 forward. The Metal Chapter is a set of discrete lower-level benchmarks around the CPU. This series of tests evaluates capabilities such as: CPU performance on integer and floating point operations, memory read/write and peak bandwidth performance, and memory branching speed. Vellamo offers a series of “extra” tests that cover a variety of mobile performance areas and are outside of the HTML5 and Metal chapters. Is this a chess program? Steve.R wrote: Is this a chess program? It is a benchmarking software for Android. Used much in the same way benchmarking tools gauge a CPU performance beneficial to chess, so can this tool be used. Since Chess gives a fairly good indication of a CPU's horsepower, as chess AI programs make massive use of number crunching through random nature of positions, it is good to target specific areas of this data for comparison, if such a software is available. This can allow you to improve your CPU output and consequently your computer chess output.